"Janie Marie Matthews, Westbrook College, Class of 1977"
Westbrook College student Janie Marie Matthews, Class of 1977, was a Medical Technology major and a Day Hop. For her senior class candid photo, which appeared in the 1977 Tower Yearbook, she wore a long dark wool coat with hood. Her dark hair was chin length and parted in the middle. 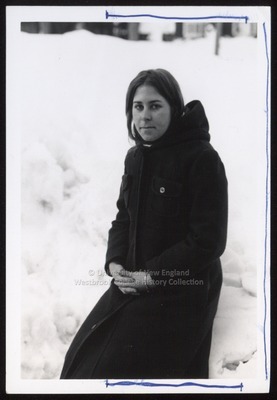 Janie perches on a mound of snow with her hands folded in her lap.